BOTH Plate finalists were delighted to pick up their first Cuestars trophies. 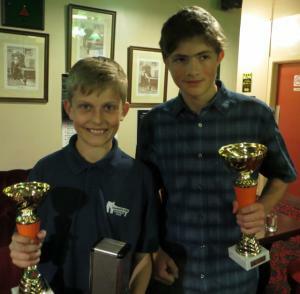 Keegan Reed (Salisbury) beat his fellow Bronze Tour player Ryan Hughes (Chandler’s Ford) in the final of the competition for non-qualifiers at the last leg of the South of England Under-21 Tours at Salisbury Snooker Club. It should be noted that Reed, who thinks it’s most unfair that Bronze players only receive a 28-point start from Gold players, beat the Gold rankings winner Brad Chappell in the quarter-finals. PRELIMS: Harvey Banger (Chandler’s Ford SC) beat James Woodley (Nailsea Social Club), Callum White (Copnor SC, Portsmouth) beat Austen Petty (Chandler’s Ford SC), Dan Sykes (Chandler’s Ford SC) beat Quaid Bennett (Nailsea Social Club). LAST-16: Banger beat White, Steven Hughes (Chandler’s Ford SC) beat Sykes (Chandler’s Ford SC), Brad Chappell (Greenbaize, Bournemouth) beat Nat Kidner (Greenbaize, Bournemouth), Keegan Reed (Salisbury SC) beat Callum Georgiou (Nailsea Social Club), Ryan Hughes (Chandler’s Ford SC) beat Adam Cowdroy (Greenbaize, Bournemouth), Luke McCormick (Mayfair, Gosport) beat Callum Parsons (Nailsea Social Club), Kaine Petty (Salisbury SC) beat Callum Browne (Player’s, Westbury), Albert Warren (Salisbury SC) beat Connor Shaw (Greenbaize, Bournemouth). QUARTER-FINALS: Banger beat S Hughes, Reed beat Chappell, R Hughes beat McCormick, Warren beat Petty. SEMI-FINALS: Reed beat Banger, R Hughes beat Warren. FINAL: Reed beat R Hughes.